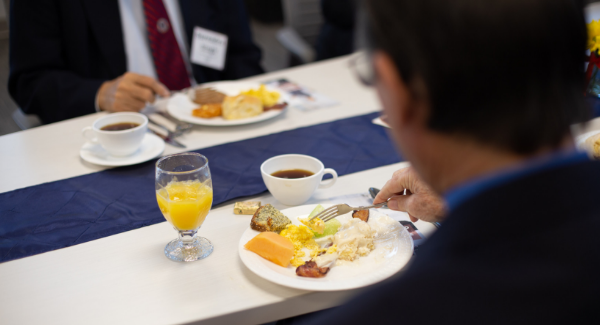 Newman University hosts an elected officials breakfast annually to connect legislators to the university and notify them of its academic advances and challenges. 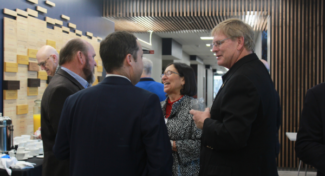 President Noreen M Carrocci, Ph.D., invited the elected officials to campus on Thursday, Nov. 9, to enjoy breakfast in the new Bishop Gerber Science Center. Leo Delperdang, a Republican member of the Kansas House of Representatives returned to his alma mater for the event. He has been serving as a member of the House of Representatives since 2017 and is enjoying his time in office. “It’s an experience you can’t really explain until you’re there,” he said. Delperdang serves on multiple committees in Topeka. He worked for AT&T for many years before retiring in 2012, and finds it fitting that he sits on the Utilities and Telecommunications committee. Along with that, he serves on the Corrections and Juvenile Justice committee, Transportation and Public Safety Budget committee and the Veterans and Military committee. As a graduate of Newman, Delperdang said his time at the university was a great experience. He graduated from Kansas Newman College with a business management degree in 1993. He particularly got along with business professor Sister Vickie Bergkamp, who urged him to come back for his master’s soon after. Delperdang achieved his master’s in organizational leadership in 1999 and a small claim to fame to go with it. Leo Delperdang (r) speaks with Matt Lindsey (l) before breakfast. Since then, Delperdang has attended multiple other universities for technical degrees but said they just don’t compare to Newman. During breakfast, guest speaker Matt Lindsey, president of the Kansas Independent College Association (KICA), shared some data about the outcomes of attending a KICA school. Lindsey represents the 19 nonprofit, regionally accredited institutions based in Kansas, which includes schools like Benedictine University, Friends University, Sterling College and more. He addressed the affordability and innovative nature of the KICA schools. “It’s not more expensive to go to a private college,” he said. “That’s a myth. 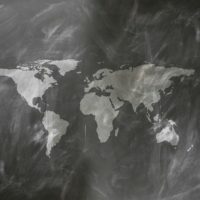 For individuals at every income level, the net price for Newman University, in particular, is even more affordable than local public universities by upwards of 35 percent. This is due to the fact that 99 percent of KICA students receive some form of scholarship or financial aid. 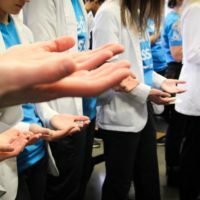 Last year, a collective $158 million was given as privately-raised student aid which makes KICA institutions the largest charity in the state of Kansas by a long shot. A small portion of funds raised for students attending a KICA school comes from the state through the Kansas Comprehensive Grant. Because of this program, taxpayer cost per bachelor’s degree at any KICA school is $2,552, but at Kansas Board of Regent schools, it is $29,000. “We are efficient and enormously effective with the program we already have and yet it has been dramatically underfunded.” Something Lindsey says he understands as more funds are needed nearly everywhere. However, Kansas ranks 45 in the United States in need-based aid per student. Lindsey said universities are losing Kansas students to other states because they are able to offer a larger need-based aid package. “If you want to find a way to enhance college affordability, access and completion in Kansas, we have a program that already works and we can put more money into it. … If you want to ‘fix’ college in Kansas, this is your tool and it already works,” Lindsey explained to the legislators attending the breakfast. President Carrocci spoke after Lindsey about the innovative programs coming to Newman University including a bachelor’s of social work program and a data analytics program. Elected officials were invited to stay for conversation following the event. Tours of the new Bishop Gerber Science Center were also offered to attendees.